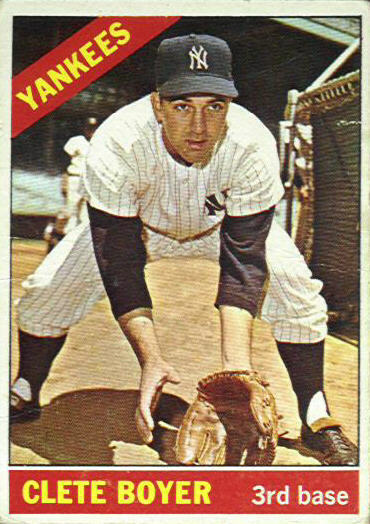 My first memory of Clete Boyer was of him playing third base for the great New York Yankee team of 1961. I can still see him in his number 6 pinstriped jersey, making a diving stop on a hard hit ground ball down the line and jumping to his feet to throw a bullet to Moose Skowron with his powerful right arm to nip an opposing runner at first base. Just one season before, Casey Stengel had almost destroyed Boyer’s confidence by pinch-hitting Dale Long for him in the second inning of the very first game of the 1960 World Series. Ralph Houk had replaced Stengel in 1961 and assured Boyer he would be New York’s every day third baseman. Clete was constantly among league leaders in assists, chances and double plays but he would watch Brooks Robinson win the AL Gold Glove for third baseman year in and year out. Boyer had to leave the league to win his first and only Gold Glove for Atlanta, in 1969. Clete was not a great hitter but his offensive numbers with New York would have been better if he did not occupy the eighth spot in the Yankee lineup. With the pitcher hitting behind him, Boyer saw very few strikes and was too aggressive at the plate to work the count effectively. As a result, he usually hit in the .240s and struck out close to 100 times a year during his Yankee career. But he also had enough power to hit 95 home runs during his eight seasons in New York, a respectable number considering that he played half his games in a Yankee Stadium that was not at all conducive to right-handed power. Boyer was the Yankees’ regular third baseman for seven seasons, winning five pennants and two World Series during that time. He was one of the few veterans on the team not to experience a drastic decline in his offensive numbers during the debacle seasons of 1965 and ’66. Still, he was purged during the mid-sixties house-cleaning that saw New York trade one veteran after another in return for mediocre players who would never succeed with the Yankees. In Boyer’s case, he was swapped for a young outfielder from the Braves named Bill Robinson who hit just .206 during three dreadful seasons in pinstripes. Meanwhile, Boyer had a career year his first season in Atlanta, with 26 home runs and 96 RBIs in 1967. Clete remained with the Braves until he retired as a player after the 1971 season. Born in Cassville, MO, in 1937, Clete was one of 14 Boyer children. His older brothers, Cloyd, a pitcher and Ken, a third baseman and one-time NL MVP with St Louis, also played in the big leagues. Clete died in 2007. He shares his February 9th birthday with another third baseman who played on the great 1927 Yankee team, this one-time Yankee second base prospect and this one-time Yankee catching prospect. Since we’re celebrating the birthday of two Yankee third baseman, I thought I’d share my picks for the top five third baseman in Yankee history. Here they are. What do you think? Number 1 – Alex Rodriguez – Passed Nettles in both home runs and RBIs as a Yankee in 2010 even though he’s played 500 fewer games. Number 2 – Graig Nettles – Won two rings, two Gold Gloves, hit most home runs, and played most games as Yankee third baseman. Number 3 – Red Rolfe – A .289 lifetime hitter with five rings and a great glove. Number 5 – Wade Boggs – Won two rings, two Gold Gloves and averaged .313 in pinstripes.